California Checker Club car show organizer Kathryn Bassett with some of her vintage Checker memorabilia. The annual show was held at the L.A. County Arboretum on July 27. It's a story Pasadena resident Kathryn Bassett has told and re-told over the 20 years since her beloved's untimely demise. In the fall of 1988, the sad tale of Sherman's passing and subsequent funeral was splayed across the pages of the Los Angeles Times and eventually reached tabloid fame in the National Enquirer. Today, Bassett still remembers him as "reliable." He was the type that made you feel "safe and protected," she said. In short, "Sherman" — a 1981 light blue Checker — was the best car she'd ever had. 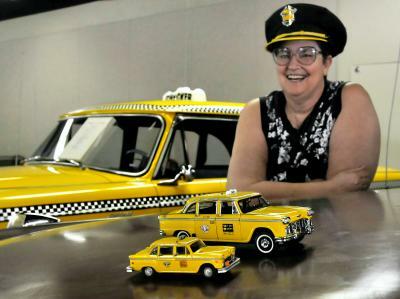 Since Sherman's departure, Bassett has never owned another Checker, but she has remained a devoted fan of the car — most famous for its role as the iconic taxi cab. In 1990, she formally founded the California Checker Club. The regional group, known as a "taxi stand" to the national Checker Car Club of America, hosted its 18th annual show on Sunday, July 27, at the Los Angeles County Arboretum in Arcadia. Along with eight classic Checkers on display in Ayers Hall, Bassett showcased a sizeable portion of her collection of Checkers ephemera. She has somewhere between 500 and 1,000 individual collectibles. "I stopped counting a long time ago," she said. "I really got into it after my Checker burned." Sherman, who rolled off the assembly line at Checker Motors Corp. on Valentine's Day in 1981, had proved a perfect match for his 5-foot-11 owner. She was first introduced to the make of car as a cab driver in the mid-'70s for the now-defunct San Gabriel Valley Cab Company. "Between my height and the comfort level, I fell in love with the Checker," Bassett said. She named him Sherman after the primary tank used by Allied forces in World War II. "With having a Checker, you might as well have a Sherman tank," Bassett said. "If you get hit, it's the other guy that's gonna suffer the damage." But in 1988, after seven years and more than 116,000 miles, Sherman reached the end of his road. While driving home from a trip to San Francisco, Bassett said she noticed steam emanating from her car's engine, and she pulled over on the 210 Freeway just past the Sunland Avenue exit near Tujunga. A few minutes later, Sherman started to burn. "At first I thought my radiator had blown, because it was steaming," Bassett said. "But it actually didn't start smoking until I pulled off and was already on the call box." There was little emergency responders could do to save Sherman. The fire marshal later fingered a busted water pump as the inferno-starting culprit, she said. After Sherman's tragically unplanned funeral pyre, another Checker owner joked that Bassett should put together a more stately service. But when the collectible car appraiser assigned to evaluate Sherman's worth got behind the idea — he even offered to give the eulogy — a media event was born. For their efforts, Bassett, dressed in a Victorian-era mourning gown, and 15 attendants landed on the cover of the Times' San Gabriel Valley section under the headline, "Checkered Past: Car Aficionados Bid Farewell to Sherman, a Fallen Warrior." A few months later, a National Enquirer spread followed suit. If Checker owners have a reputation, it's as an "eccentric bunch," said Joe Pollard, the California Checker Club's current president. As a musician, Pollard's first contact with a Checker came in the mid-'70s, when he discovered that the hefty car could fit his entire drum set and then some. Now a Chatsworth resident, Pollard is known as something of an expert among the Checker community, and he has capitalized on the dwindling number of models and parts available since the Checker Motors Corp. shut down production in 1982. "Every time I needed a part, I would buy the same model car to replace it," he said. "They weren't that expensive back then, so I'd just have them shipped out here ... and I just kept ending up with more and more cars." Pollard has since amassed a collection of 60 operating Checkers and another 100 non-operational ones that are part of a salvage yard he runs in the Mojave desert. About 30 years ago, Pollard also started making his own Checker parts, and within a year started receiving orders from other owners. His Chatsworth-based business is now the largest supplier of Checker parts. "People out in Chatsworth think there's hundreds of Checkers around 'cause they see them all the time," he said with a laugh. Another place Checkers appear with a degree of regularity is in movies and television, an industry Pollard also caters to. "As time goes by, there are even less and less of them," he said. "I became pretty much the only guy that you can turn to if you need more than 10." Twelve of Pollard's Checkers made their major motion picture debut in 1998's "Why Do Fools Fall in Love?" Since then, his cars have appeared in numerous commercials, TV shows and movies, including a fleet of 50 in Steven Spielberg's "Catch Me If You Can" (2002). "Checkers attract more attention than just about anything else you can do for a promotion," Pollard said. "You can send a fleet of Rolls Royces through town and no one would notice, but put three Checkers and paint them yellow — they'll stop traffic." The attention from strangers is something Checker owners have come to expect and enjoy. "It always brought a smile to people's faces," Bassett said of driving her '81 Checker around town. "People would give you a thumbs up." Checkers, for one, tend to be more visible than other antique cars because their owners often drive them as their day-to-day vehicle, said Ron Leatz, president of the Checker Car Club of America. They are not "kept on a little pedestal and sealed in Saran Wrap," Pollard said. It suits the utilitarian nature of the vehicles, he said, which were designed primarily as a formidable taxi cab that would withstand the wear and tear of high mileage. "They are driven," Leatz said. "They're not put in the garage and never seen again." A former Victorville resident who now resides in Dowagiac, Mich., about 46 miles from Kalamazoo and the former Checker Motors Corp. factory, Leatz said he expects to purchase his very first Checker in the next 30 days. "I've waited 15 years for this," he said. "I can't wait, to be honest with you." Leatz recently helped organize the national Checker car show, which was held in late June in Kalamazoo. Next year, the national show will travel for the first time to the Arboretum in Arcadia. Membership for the national and regional clubs have been slowly dwindling over the last couple decades. Once boasting as many as 1,000, the Checker Car Club of America now counts around 400 members nationwide. But Checker aficionados aren't yet ready to sound the death knell for the classic cars. And automotive enthusiasts as a whole certainly haven't written off the hulking, easily recognized vehicles. The Checker Marathon, a model produced between 1961 and 1982 as sedans and station wagons, will be featured in an upcoming episode of "101 Cars You Must Drive" on the SPEED Channel. The episode premieres Monday, Aug. 25, at 6 p.m. PST. "Every car has a story," said the show's writer and producer, Stan Rarden, of Tampa, Fla.-based Restoration Productions. "They all have a following somewhere, even the Checker." Checker fans have another thing going for them that may just keep the engine running: They're serious about their rides. "Never in my life," Rarden said, "have I seen a bunch of people more over-the-top dedicated to their cars."